One of the greatest things about teaching in a big city like NYC is that there are resources everywhere you turn. Some of them are great, some of them are so-so and some turn out to be terrible. But there is no shortage of opportunities for learning outside the classroom. One of the biggest concerns, however, of inner-city classrooms is a lack of sufficient funding to make use of all the opportunities available. Sometimes, though, you come across an incredibly rich experience that is also entirely free. 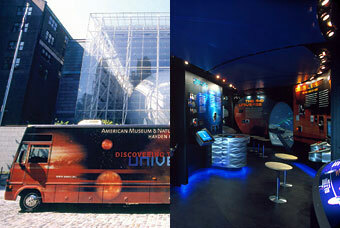 The American Museum of Natural History has such an experience: the Moveable Museum. Yesterday, I had the joy of welcoming the “Discovering the Universe” bus to my school. The museum educators came into each of my four high school science classes, gave an intro to astronomy lesson and then took students onto the bus — a large, windowless vehicle that has been gutted and turned into an interactive laboratory for students to explore concepts in astronomy and astrophysics. My students looked at infrared cameras, peered into different types of telescopes to gaze far into outer space and operated a flight simulator to explore the planets of our solar system. I heard kids saying it was the first time they had enjoyed science and others comparing the activities to playing video games. Even my worst students kept their behavior in check long enough to experience a whole new world of astronomy. Today we discussed the museum and students were still engaged and interested in sharing their experiences. Best of all, it was totally free and only took an hour and a half per class, so they could still attend most of their other classes. where teachers get to view museum exhibits for free and gain access to related resources, to whole staff development workshops. The museum itself is a great resource for students and teachers alike, but the educational outreach they do is far greater than the museum alone. I highly recommend all teachers take a look at what they have to offer. The programs are great, most of them are free, and it really gets students engaged in topics that can often seem irrelevant to their daily lives. This is a fantastic idea! I think more museums should have programs like this to get children interested in science and the world around them.